This is an extraordinary litter, Janet, and you and Scout have definitely contributed to this breed! I am so lucky to have a part in showing this lovely young daughter of Ms. Scout and Mr. Chaseman! She's totally delightful and a credit to both of her parents. I know how proud you are of all of the Ocho--deservedly so! Lowri is a product of our two good dogs. I think she is better than they are. . . And that's why we breed. Thank you Janet for your faith in Chase. The kids are doing wonderfully. That is wonderful, Janet! Thank you so much for letting her come live with me. Scout produced some beautiful puppies. Not only are they beautiful to look at, they are delightful to live with. That post got me all teary. I was explaining to The Huz yesterday that every time one of the Ocho does something, it makes me so proud. And not just because they are extraordinary dogs, but they come with some pretty fantastic people attached that I consider my friends. I'm so happy for everyone and their success in and out of the ring! What a wonderful tribute, not just to Scout and her babies, but to the whole breed (I mean this is really what it's all about). Congratulations to you and Scout (and Lowri and Sally and Tommy...and the remaining five and their dad, Chase)! P.S. Have fun in Richmond and in NY! I felt the love. How proud you must be of all of them. 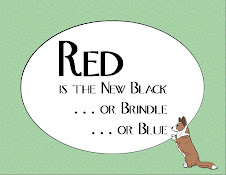 Hi – Will you please post a link to your Blog at The Cardigan Welsh Corgi Community at vorts.com? Our members will love it. Members include: CWG Owners, Breeders, Rescues and Lovers.